... about to embark on another year, 2011, and a new location for Tortillaville too; Big Pine Key, FL. This is us realizing a dream, not THE dream per se, but a dream. 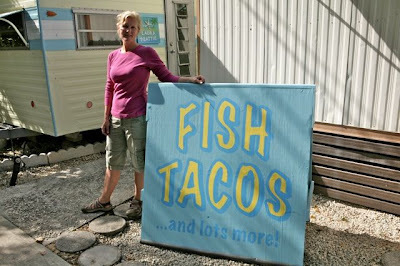 It was a many years back, while vacationing in the FL Keys, during the long drive, when my stomach yearned for a fish taco. The memory of it is still imbedded in my psyche. But, there was no where to find a fish taco. Why??? So, we took our chances and stopped at a US 1 restaurant, only to have a mediocre experience. Then, several years later in 2009, the year of the great recession, we took a contemplative drive to Rhinebeck, NY. Stopping at a red light, and the intersection of Fear and Hope Boulevards, we came across a shiny new concession trailer for sale. "Fear and Hope, meet Chance." said a voice in my head. “Nice to meet you Chance, I need a favor.” I said. And, so it went. It took us a month to figure out what we would sell from this shiny fun kitchen on wheels before deciding on tacos and burritos. Then, a new road to navigate; a name, recipes, a location, etc., and alas, Hudson, NY and now Big Pine Key, FL. Who would have thought? Travelers will no longer have to go hungry with 30 miles left to go to Key West. For we, are the roadside haunt that will rescue them. And, our big beautiful sign, "Fish Tacos", is hopefully a lucky lure to sway them over. Lucky for them too, if they do. It is wonderful down here in the Keys. And, we equally enjoy our five + months in Hudson, NY. We are trying to find balance, and to make a living at the same time. I can't say what “THE dream” is just yet, other than it has something to do with; community service, less work, more money, and greater reward. We have an idea and we hope to make it happen one day. It's a simple concept actually, and one that everyone could use; friendship, conversation, meals, perspective, and experiences together. For now, it is all about Tortillaville South. The signs are painted, the food is prepped, the vehicles are loaded. And, by noon time new year's day, 1/1/11 to be exact, we will have the entire year ahead of us to attempt to make each day better than the one before it, but to forgive our misses. We wish the same for you. So, we have a dream, but it is also our hope that the dream of MLK will continue to see the light of day, starting with - stopping all wars. We have another dream. May 2011 be good to you, and you to it.